Since moving over from Brisbane in 2016 Redden has been a shadow of the player he once was. As an integral part of Brisbane’s midfield previously Redden was producing awesome fantasy numbers, with his 2014 season having him average 105 including 5 scores over 120 and a ceiling of 131. Unfortunately his 2015 (while still producing decent fantasy numbers) was injury affected and that continued through to his first season with West Coast where, along with struggling to break into West Coast’s midfield, he struggled to keep his spot in their best 22 and found himself playing WAFL to find form. 2017 started much the same for Redden, while he was still fit, his time in the West Coast engine room as an inside midfielder was limited, especially with Sam Mitchell slotting in. This first half of the season saw Redden play the first 9 rounds, only managing an average of 70.7 before being dropped back to the WAFL. However something changed midway through the season, West Coast started needing to look to the future. With Priddis and Mitchell looking likely to step down Redden was recalled from the WAFL in round 15 and was finally given the chance to be West Coast’s go to inside midfielder. While West Coast do have plenty of options to experiment with covering the loss of Matthew Priddis (more on that later) Jack Redden does set himself apart by being an above average rated tackle which makes him the closest ‘like for like’ replacement on the list. Competition for the spot is intense though and if preseason training is anything to go by, Redden is looking to earn that place by posting personal best times in his time trials and looking fitter than ever. Given he is priced at an average of 83, his potential does suggest he is underpriced and could be a value pick. My biggest issue with picking Redden this year is whether he will get enough opportunity. In Redden’s fantasy glory days, he was in a midfield consisting of himself and Rockliff. Zorko was still transitioning from small forward to mid, Rich was looking better as a defender and Moloney couldn’t stay on the park. Other midfield options were slim and it saw Redden get plenty of opportunity. While the loss of Mitchell and Priddis would seem like there’s plenty of space for Redden now, he’ll be sharing the midfield with Shuey, Gaff, Yeo and possibly Hutchings if he’s tagging anyone. Sheed will continue to be given the chance to develop while Ah Chee was recruited to be an inside mid. Then there’s the next wave of midfielders coming through in Partington, Mutimer, Venables, Ainsworth and Brayshaw all looking for opportunity. Based on the end of last year, Redden should have his place in West Coast’s best 22 locked up but I just don’t think he’ll see enough midfield minutes to get the same numbers as his 2014 season and as his last 2 seasons have shown, he doesn’t score as well when he’s splitting his minutes between inside mid and fwd flank. At his awkward price point, you’d be wanting much more. Jack – While it’s easy to think that because Redden has been a premo before he can be again, I just don’t believe West Coast will be as reliant on him as Brisbane were then. If he’d left his great run of form till later in the season and was priced at 75 points he’d be a lock, but a possible 10 point upside just isn’t enough to justify spending that much for me. As a West Coast fan though I really hope he proves me wrong! Will you be starting with Redden? Another useless card everyone knows he will av about that. Can we have random cards? If you can’t appreciate the time & effort put in to writing these articles then why not do your own research rather then slagging off the writers! I wasn’t buying the Redden hype but this article has reiterated that to me so if he goes big in JLT i won’t get sucked in. Thanks Anthony! Keep up the good work everyone at DTTalk! Cheers for the feedback mate, this year I wrote 7 cards. I choose my cards based on a combination on who forums ect are mentioning and who I think I can offer perspective on. Out of the guys I wrote on below, 3 were players who hadn’t had cards before, the others were players who coaches are considering and hopefully the card gave them more to think about when selecting them. Ha this fool will eat his words, he has a senior role back and his tackle numbers will go up! Fool Don’t you remember the RedRockBurger combo?? 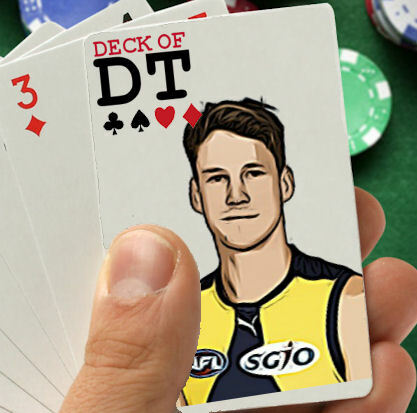 Appreciate feedback, but a Deck if DT card is more than a predicted average… and aimed at all people into their Fantasy footy – not just those why have given a player consideration and either locked or crossed them off their list. Every year is different so the same player getting a card is irrelevant. Sorry in advance for my last card coming, but it will be an interesting read due to decision making. Rubbish. The variety of different types of players has been great this year. DODT definitely has stepped up this year. Cheers anthony! Can see him staying in the middle all season with the likes of ryan, rioli, venebles, lecras, cripps fighting for spots in the forward pocket/ half forward line. I think his time in the forward line will be limited and could push 100+ being a full time mid. However in saying that i wont be starting with him yet, unless his numbers in the JLT make me select him. The respect from people commenting is non existant these days..
Can we nominate cards (Preston and Seb Ross please:) ) …. or maybe vote on a choice of 3 for a future card. How about Melbourne players Jack Viney, Harley Balic, Christian Petracca, Clayton Oliver, MIchael Hibberd, Nathan Jones.